Last weekend, I put on a bib and started a 50-mile race through Bryce Canyon. I didn't "race" a single step though. I ran when I wanted, I hiked when I didn't want to run and even walked when the other two didn't sound fun. I joked around, encouraged runners in the other races that I caught up with, pulled a few of them with me through their dark times, helped out at aid stations along the way and even stopped to take pictures. It was a much needed and different experience I have ever had after pinning a number to my shorts. Being drawn to a certain place time and time again is a feeling that each of us can relate to. Some of these places are physical locations the empower us, transcendent mental states achieved through various efforts, or they can even be spiritual connections we make with the solitude and time spent in mountains. For me, there is one place that I return to year after year that can offer all three. I yearn to go back every June in order to grow as an athlete and person. It's a place like no where else. 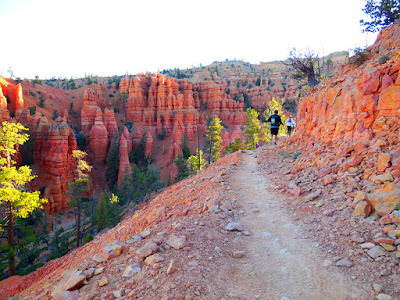 Bryce Canyon is that sacred place to me. It started my ultra running career 4 years ago (with undoubtedly my most miserable yet satisfying experience to date) and then turned around to give me my first 100-mile win a year later. The next year was the most powerful experience I'd ever had running as I overcame so many demons and pressed on through a very difficult day. It's been a growing experience every year and I was crushed to not run the 100 again due to injuries and lack of training... but my soul stirred to cross the canyon through the highline trails and ridges to gain that perspective and enlightenment I so desperately needed. While hanging out at packet pick up on Friday, I foolishly made the decision to pick up a bib for the 50-miler when RD Matt Gunn offered the consolation prize of a shorter distance after telling him I was dropping out of the 100 this year. I had no intentions of actually racing though. I respect my competition too much to expect good race, let alone a podium, with the 30-mile weeks I’ve been able to scrape together over the last few months. Still, my heart couldn't say no to that piece of paper, the ticket that might allow it an opportunity to heal as it has experienced deep in those canyons in the years past. It knew this place had healing to offer my soul. So I grabbed it with the only purpose of getting that personal time to refocus my life. To offer myself to the canyon in hopes that it would offer me back the perspective and experience that I needed. Through a long and hard 50 miles, I was able to gain yet another incredible experience on the Paunsaugunt plateau overlooking natural wonders of this land. I shed sweat, blood, tears, and the weight of so many emotions I had been carrying with me for much too long throughout those miles. I laughed, cried, and looked forward with hope, all without once looking back in regret. Life has, and I assume always will be, a learning and growing experience. A constant evolution of self. That’s what makes it such a challenge and experience. I have evolved so much in the last few years and I hope to continue growing and changing as time and miles pass. Life, after all, is nothing more than a series of opportunities to react and respond to what it throws at you. Some experiences are precious and intimate. The understandings and thoughts that I had on the trail that day aren’t for me to discuss but rather cherish and respect for myself… suffice it to say that I am better for having picked up that bib and taken the chance at the 50-miles I had no business trying to run. I challenge everyone to find their special place. Whether it’s the dusty trails of favorite run, the euphoria felt after exhausting yourself to the top of a climb, or a just simply a course that takes you along your favorite views that make you look with wonder, visit your place regularly. Dive into your own soul to find new purpose or reconfirm your current purpose. We all need time to reflect in deep introspection to learn from our constantly evolving souls. We will all be better for it. Being true to myself while supporting those around me who have been so much in my life is a new focus of mine. I’m so grateful for my team, sponsors and friends that continually encourage the evolving person that I am. They know my heart and they appreciate my spirit. I am grateful and humbled by that. And thank you for ALL your support and encouragement.